Penguin Random House has launched a publicity campaign for Hanns And Rudolf this week. Across theLondon Underground posters of the books have been pasted to walls. I think they look amazing, don't you? The book is also available now in Tescos and WH Smith. 70 years ago today, Anna Abraham was murdered in Auschwitz having been deported from the Theresienstadt concentration camp. 72 years ago, Cäcilie Bing, was deported from Theresienstadt to Treblinka. Anna had a weekend house in Groß Glienicke. You can read about her story here. Cäcilie Bing was Henny Alexander's aunt, she would have visited the Alexander's house in Groß Glienicke. You can read about the Alexander story here. Hanns and Rudolf was the #7 in bestseller in the UK category: general paperback non-fiction. This will be announced on the Sunday Times on 18 May 2014. Hanns and Rudolf was released as a paperback on 1 May 2014, this is the first full week it has been in the bookshops. Hanns and Rudolf was chosen as non-fiction book of the month by the bookseller Waterstones. The UK's largest book retailer has selected Hanns and Rudolf as their non-fiction book of the month for May. Shortlisted for the Costa Biography Award Hanns and Rudolf tells the story of two German men whose lives crossed in an shocking way. Hanns, the son of a prosperous family, fled Berlin in the 1930s for London. Rudolf, farmer and soldier, became the Kommandant of Auschwitz Concentration Camp. After the Second World War a British War Crimes Investigation is assembled to hunt down senior Nazi officials. Hanns is lead investigator, his most elusive target, Rudolf. Who is going to educate young people about the Holocaust when the survivors are no longer with us? That is the question I keep asking myself in the days leading up to Holocaust Memorial Day on 27 January 2014. Because the further we get from the end of the Second World War, the fewer survivors we have to share their powerful stories. During a recent book tour in the USA I was hosted by a Holocaust educator in each city, and every one of them told me that they were worried that they would soon have no survivors to help them with their work. And they have good reason to worry. To have a Holocaust survivor talk to a group of young people is a precious thing. It makes the tragedy real, visceral. It has impact. I have seen this frequently. The room goes quiet. The survivor tells his or her story. The kids are changed. I observed this at one of my book events. I had been speaking for over an hour, people were growing restless, one man even asked if it was time for lunch. Then a survivor stood up, the room hushed. With a microphone to her trembling lips she said that when she had left Auschwitz she had weighed fifty-eight pounds. In those few words she said so much more than I ever could in an hour. It was terrible. She had survived. And she was brave enough to tell the tale. A lady who works at one of the leading Holocaust research centres in England told me that they are carrying out a 'strategic review' on the subject. All of which I know, and is good, but it is not quite the same. And I do worry, especially about the teaching materials. When I ask which books teachers are using I am told, "Well, there is the Diary of Anne Frank". It has sold millions of copies, it has been translated into scores of languages, it's true and it's powerful. Fair enough. What else? I ask. "Well," they say, now wincing, each and every one of them - from Brooklyn to Birmingham, from North West Washington DC to North West London - "teachers are increasingly using the Boy with the Striped Pyjamas." They add, it's an easy teach: it's about children, it's very well written, there's even a movie the kids can watch. For those who don't know, the Boy with the Striped Pyjamas is about the son of a concentration camp kommandant who befriends a Jewish boy prisoner. While fictional, it is clear that the story is largely based on the family of Rudolf Höss, the Kommandant of Auschwitz. Now I know a little about Rudolf Höss' family. In 2009, I travelled to Auschwitz with Rudolf Höss' daughter-in-law and grandson, and then a couple of years later, I interviewed Brigitte, the Kommandant's eighty-year-old daughter, who now lives outside of Washington DC. And I can tell you, having spent time with the Höss family, with a great degree of confidence, that the Kommandant's children never played with Jewish kids, let alone befriended them. To the contrary, the Höss children pinned triangles and stars to their shirts and pretended to be prisoners, like Cowboys and Indians. So we have a second problem, a fictional holocaust is increasingly being taught to kids. This week I gave the annual Merlyn-Rees Lecture for the Holocaust Education Trust at the Houses of Parliament in London. The room was packed, with over three hundred people: camps survivors, Members of Parliament, journalists and students. The audience was alert, committed, and eager to learn. Afterwards at dinner, I sat next to Holocaust survivor, Ben Heflgott. He told me that when he was nine-years-old he had been forced into a ghetto in Poland, a few years later he was sent to Buchenwald and then Theresienstadt. With the exception of one sister, his entire family was murdered by the Nazis. Now, almost seventy years later, I asked him what he thinks about holocaust education in the so-called 'post-survivor era'. He put down his fork, turned to me and said, "it's simple, the next generation will have to do it. And they will be even better." That is the answer to my question. We will just have to do it. Better. It is that simple. 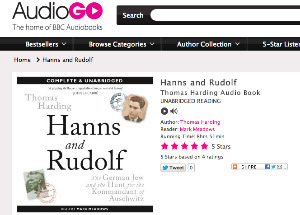 Hanns and Rudolf is now available as an audiobook on Audible.com and Audible.co.uk is unabridged, lasts 8 hrs and 50 mins and is read beautifully by the actor Mark Meadows, the narrator of Book Prize-winning book, The Luminaries. Wow! That was quite journey. 17 Days away from home. Nine cities. Eleven events. Eight interviews (some of which I have posted to the Video and Audio page). A lot of travelling, many miles traversed. All in all, a very rewarding experience. It was so interesting getting to hear from people in cities from Detroit to Atlanta, Brooklyn to Montreal, Shepherstown West Virginia to London Ontario. There is something both humbling and exciting to hear directly from audiences. Humbling, because many of those who spoke were holocaust survivors, generously sharing their personal stories. Exciting, to hear people's thoughts on the book, the themes that it raises, the greater issues surrounding the human experience which can be quickly jumped to from the story and the characters involved. Most of all it was thrilling to see people caught up in the story itself. Tapping away at my computer all those years I never imagined such a thing. A mighty 'thank you', therefore, to all those who hosted me, organised the events, arranged the intricate logistics (trains, taxis, planes, hotels, meals, lifts from private individuals, even a Greyhound bus). It was a blast, a brilliant experience. I learned so much, enjoyed many terrific conversations, was privileged to meet some incredible people, a true honour. And while I am headed home and, believe me, I am looking forward to it, I am looking forward to another book tour in the not too distant future. 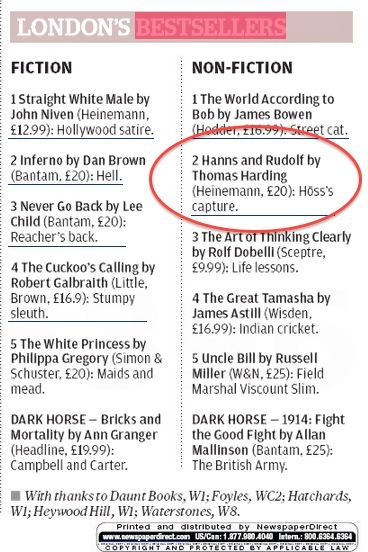 Evening Standard ran a story today that Hanns And Rudolf was 2nd highest London non-fiction bestseller. It has been a very intense week. As the book has been released in the UK, and the reviews start to come out, I have been in Berlin visiting the childhood home of Hanns Alexander. I went back to the Alexander home on Kaiserallee (now Bundesallee), saw the Zoo, the Neue synagogue and the Reichstag. Most exciting/ emotional was paying a visit to Groß Glienicke, the small village to the west of the city where my family had a weekend home. Today I rowed across the lake with my wife, saw the clouds rolls by, the ducks floats in the gentle waters, I drank a beer at the restaurant at the end of the lake. This is the first time in 77 years that a family members has been on the lake. It was beautiful and calm. It made me understand why my great-grandfather, his wife and kids loved this place so much. It is not an easy task to compress over 90,000 words (from my book) to less than 3,000 for the extract in the paper. The team at the Sunday Times did a fabulous job with this, maintaining the sense of the two interweaving stories and keeping the tension. And the photographic department did a terrific job with the images, and I also love the timeline at the end of the piece. So after seven years of research, the day is finally approaching. The book will be available via Kindle on August 19, in UK stores on August 22, and US and Canadian stores on September 3. As the launch day near I've been writing feature articles and op-ed pieces. I spent this week writing a magazine story for the Washington Post (pub date Sep 8), a blog for the Daily Beast, and an op-ed piece for the Huffington Post. The Sunday Times plans to run an extract of the book on Aug 18. The Guardian Family plans to run a feature at the end of August. It's been really interesting seeing how the media in various countries have reacted to the book. As soon as the articles are published I will post to this site for easy access. Netgalley, the online supplier of book proofs and advanced galleys to professional readers, bloggers, publishers and libraries, chose Thomas Harding's book 'Hanns and Rudolf' for its list of THE UK'S TOP TEN MUST READS: SEPTEMBER 2013. In advance of the book’s September publication, author Thomas Harding and his editor, Tom Avery, took a trip to Clays in Bungay to watch the book roll off the presses. It was a fascinating day out. Clays told us they print over 3 million books each week. While we were there we saw some of the world's top authors printed. We promised not to tell anyone what we saw (though the presses did seem to be very busy with JK Rowling's new book!). Most exciting, of course, was seeing my book being printed. By the time we arrived the plates had already been made. the pages printed and formed into blocks. We were able to see the cases being put onto the blocks , the cover folded around the case and then the belly band being added. Click here to see Windmill Books page on Tom and Thomas's visit to the printing process. So there has been much discussion about the correct pronunciation of my great-uncle's name. Most English speakers say 'Hanns' rhyming with 'pans' or 'tans'. This is not how Hanns said his name, nor how the members of the family called him. Instead, we say 'Hanns', like Hantz. It should be said quickly, the same way that 'once' is almost snipped at the end, in contrast 'pans' runs on a bit.